Since it’s Valentine’s Day (have a happy one), we might as well talk about a candy company, in this case, Mars, Inc.
Mars, Inc., one of the defectors from the Grocery Manufacturers Association (see yesterday’s post) has also withdrawn from membership in and support of the International Life Sciences Institute (ILSI), a group that claims to be independent but in fact is funded by hundreds of food and beverage companies (hence: front group). ILSI’s positions on food issues are decidedly pro-industry, and so are the results of its sponsored research. Mars couldn’t take it anymore. After careful consideration, Mars will end its relationship with the International Life Sciences Institute (ILSI) by the end of 2018, and is withdrawing from ILSI’s nutrition committees immediately,” the company said in a statement to POLITICO. “Increasingly, the presentation of certain studies by ILSI has been at odds with our position and principles. Mars has a long history of engaging in external research that is evidence-based and data-driven, particularly in the area of promoting public health. We wish to thank ILSI for its partnership. Mars announces this departure as a component of its new research and engagement policy. The policy applies to all of Mars’ partnerships with universities, governmental and non-governmental organizations, foundations, individuals, food companies, and trade associations (like ILSI). Let’s give Mars, Inc. credit for recognizing that its funded research (especially its earlier research on chocolate and later research on CocoaVia flavanol supplements) appear conflicted, and for trying to do something about it. Let’s hope the company succeeds in putting these principles into practice. The National Library of Medicine (NLM) has quietly announced that it will henceforth include funding and conflict-of-interest statements on the abstracts published on PubMed, its searchable site for scientific publications. This happened because of a petition organized by the Center for Science in the Public Interest (CSPI), which I signed, and which called for this method of disclosure. CSPI sent a formal request to the NLM on March 30, 2016. The NLM announcement came one year later. Hundreds of millions of searches are conducted on PubMed annually by people around the globe. In a March 2016 letter to NIH and NLM, CSPI and other supporters cited studies published in Cochrane Collaboration, PLoS Medicine, and elsewhere that found that outcomes of studies on drugs, medical devices, and nutrition were often favorable to funders’ interests. New York University nutrition scientist Marion Nestle tracked 168 industry-funded studies on her blog, foodpolitics.com. By her count, 156 of those reported studies favorable to the sponsors’ interests. In Reply Mr Satin raises several points in response to my recent Invited Commentary1 about how food companies fund research for marketing purposes: (1) I give the impression that all industry-funded research is inherently tainted; (2) I ignore the industry’s triumph in fortifying foods with nutrients; (3) I fail to mention intellectual conflicts of interest; and (4) I should consider such issues before stereotyping. First, my commentary was about research sponsored by food companies specifically to demonstrate the health benefits or lack of harm of a product, or to cast doubt on evidence to the contrary. It referred to a particularly egregious example—the sugar industry’s attempt to manipulate research results.2 Although some industry-funded research does produce results contrary to the sponsor’s interests, such instances are rare.3 Most ends up useful in some way to the sponsors’ commercial objectives; it is marketing research, not basic science. All scientists have intellectual biases—that is how science gets done and why science works best when researchers with different views of science repeat each other’s experiments. But the goals of scientists pursuing intellectual hypotheses differ markedly from those of companies seeking to sell food products. Questioning food industry funding raises sensitive issues, not least because its influence on researchers occurs unconsciously, is usually unintentional, and is difficult for recipients to recognize.6 Food companies are not public health agencies and should not be expected to be; their first priority is to provide profits to owners and shareholders. Funding research helps with that effort. My purpose in writing the Invited Commentary was to bring the contradictions of food industry research funding to the attention of readers. 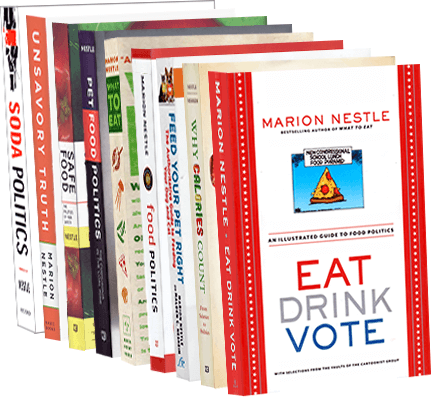 Conflict of Interest Disclosures: Dr Nestle’s salary from New York University supports her research, manuscript preparation, and website at https://foodpolitics.com. She also earns royalties from books and honoraria and travel from lectures about matters relevant to the initial Invited Commentary and this Letter in Reply. 4. The Salt Institute. Iodized salt. http://www.saltinstitute.org/news-articles/iodized-salt/. Published July 13, 2013. Accessed January 17, 2017. 5. Ksander Y. The invention of fluoride toothpaste. Indiana Public Media. http://indianapublicmedia.org/momentofindianahistory/the-invention-of-flouride-toothpaste/. Published July 10, 2006. Accessed January 17, 2017. 6. Lo B, Field MJ. Conflict of Interest in Medical Research, Education, and Practice. Washington, DC: National Academies Press; 2009. I haven’t posted an industry-funded study for a while, but here’s a good one. This is a systematic review published in the Annals of Internal Medicine attacking dietary advice to eat less sugar on the grounds that such advice is not scientifically justified. This one doesn’t pass the laugh test. What are dietary guidelines supposed to do? Tell people to eat more sugar? It was funded by the International Life Sciences Institute (ILSI), a food-industry front group. Two of the four authors consult for ILSI, and one of the two is on the scientific advisory board of Tate & Lyle, the British sugar company. The authors admit that “given our funding source, our study team has a financial conflict of interest and readers should consider our results carefully.” No kidding. It was published by a prestigious medical journal. Why? It is accompanied by an editorial that thoroughly demolishes every single one of the authors’ arguments. Cast doubt on the vast amounts of research linking excessive sugar intake to poor health. Discredit dietary guidelines aimed at reducing sugar consumption. Head off regulatory attempts to tax or label added sugars. In funding this study, ILSI is following the tobacco industry playbook to the letter. Strategy #1 is to cast doubt on the science. I detect a theme here. But I ask again: what are dietary guidelines supposed to do? We cannot lock up large numbers of people and feed them controlled amounts of sugar for decades and see what happens. Short of that, we have to do the best we can with observational and intervention studies, none of which can ever meet rigorous standards for proof. So this review is stating the obvious. Industry documents show that the F&B [Food & Beverage] industry has manipulated research on sugars for public relations purposes….Accordingly, high quality journals could refrain from publishing studies on health effects of added sugars funded by entities with commercial interests in the outcome. In summary, our concerns about the funding source and methods of the current review preclude us from accepting its conclusion that recommendations to limit added sugar consumption to less than 10% of calories are not trustworthy. Policymakers, when confronted with claims that sugar guidelines are based on “junk science,” should consider whether “junk food” was the source. I don’t ever remember seeing a paper accompanied by an invited editorial that trashes it, as this one did, but this incident suggests a useful caution. Whenever you hear that something isn’t “science-based,” look carefully to see who is paying for it. Time: Should You Trust the New Research About Sugar? The nutrition quality of lunch in fast food restaurants is similar to a typical Brazilian meal [Really? Who paid for this?]. The restaurant meals could fit into a balanced diet from time to time [Of course. Anything can]. Every meal observed here could be improved with regard to sodium and fiber to promote children’s health in adulthood [Ditto]. The authors acknowledge Equilibrium Consultancy which led this study. Funding by McDonald’s Corporation for the project was primarily to Equilibrium. This is yet another industry-funded study with results favorable to the sponsor’s interests. These especially require scrutiny of hypotheses, methods, and interpretation and repetition by independently funded investigators. My invited, accepted—but omitted—commentary about a study funded by Disney has at last been published by the Journal of the Association of Consumer Research. In February, I explained how the editors had solicited this commentary, but then given it to the article’s authors to rebut, and allowed me to comment on their rebuttal. None of this correspondence appeared when the journal published the Disney-funded article. Could Disney’s involvement have anything to do with this omission? The editors said no; they had just ran out of page room. But in April, I wrote about how Stat had obtained e-mails between Disney and one of the authors indicating that the company had attempted to withdraw its study because it feared adverse publicity. Some of the study’s authors had been associated with the Global Energy Balance Network, the group funded by Coca-Cola to promote the idea that physical activity is more important than diet in maintaining healthy weight. When I complained about the omission of my accepted piece, the editors arranged to have it and the correspondence published in the journal’s June issue.